The cemetery covers about ½ acre of land. There is no fence. The ground is covered with periwinkle vine. There is evidence that horses have been in the cemetery at least once. There were horses in the field at the time I visited. When I visited the cemetery, I parked on Chaparral Road, and followed the little creek south through the field about 200 yards. When the creek turned west, I angled southeast to the clump of trees in the middle of the pasture. The Leach family stones in the cemetery have been set in concrete bases with a pipe fence around them. There are 2 plots with 3 graves for Leaches. Their stones are on the western side of the cemetery. 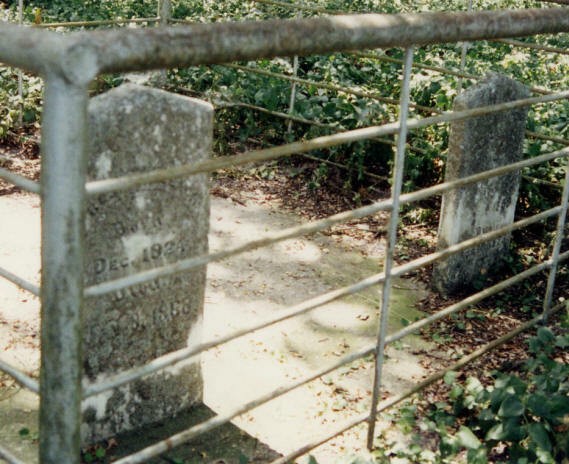 The Thomas family stones are close to the middle of the cemetery. They are all down or propped up against trees. There are maybe 3 Thomas stones and footstones. At one time the cemetery contained about 100 graves. It was used by the residents of Allen until the 1920's. Chaparral Road is the boundary between Plano and Allen in this area. There is a housing project going up on the north side of Chaparral Road. The south side of the road is a farm and open fields. In 1994 there were plans to develop the area around the cemetery. The realtor tried to give the cemetery to various groups in order to preserve it. I have not heard any more about it. This is the Jeremiah Muncey survey. His family was the one killed in the Muncey Massacre. (See Muncey Cemetery). The massacre site was on the south side of Rowlett Creek and about ¼ mile west. The family of William Perrin obtained the land sometime after the Munceys. The cemetery was probably used as the Perrin Family Cemetery. One of the Perrin daughters married a Thomas. When William Perrin divided his land among his children, she got the portion with the cemetery on it. Another Perrin daughter, Mary Elizabeth, married John Smith Huffman, Jr, who was the first doctor in Plano. They are buried at Rowlett Cemetery in Collin County, and are the great grandparents of Lyndon Baines Johnson. 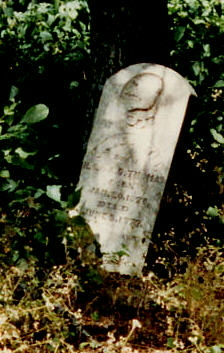 William Perrin and his wife, Dycie, are the great-great-grandparents of LBJ, and are buried here in the Thomas Cemetery. Their markers have disappeared. Rebekah Baines - Samuel Ealy Johnson, Jr.